1 - Kenwood TS-480HX for HF operations that include several choices of my home-brewed gearmotor antennas, as well as my "Really Rugged Coils" antenna system still being expanded upon to cover all bands when completed. 2a - Robust Packet APRS, consisting of a SCS Tracker DSP/TNC, the Garmin Montana, and my Kenwood TS-480HX transceiver. 2b - HF PSK-63 APRS bi-directional keyboard messaging system being used with the TS-480HX paired with a netbook running APRS Messenger. 2c - RMS Express and WINMOR RMS on my netbook interfaced with my TS-480HX for sending and receiving email through HF servers located worldwide on the Winlink system when there is no service for my smartphone. 3a- Kenwood TM-710A UHF/VHF dual band transceiver with conventional APRS system paired with a netbook running APRSIS32 for full bi-directional mapping operations. 3b - APRSLINK interfaced with D710A for sending and receiving email via the Winlink system. 4 - APRS weather station that includes a digipeater that may be commanded on or off from any APRS messaging system. This weather station may be used as a remote weather station, as it is self-contained with a Yaesu VX-170 transceiver and it's own AGM battery power that as an optional solar-panel charging system. 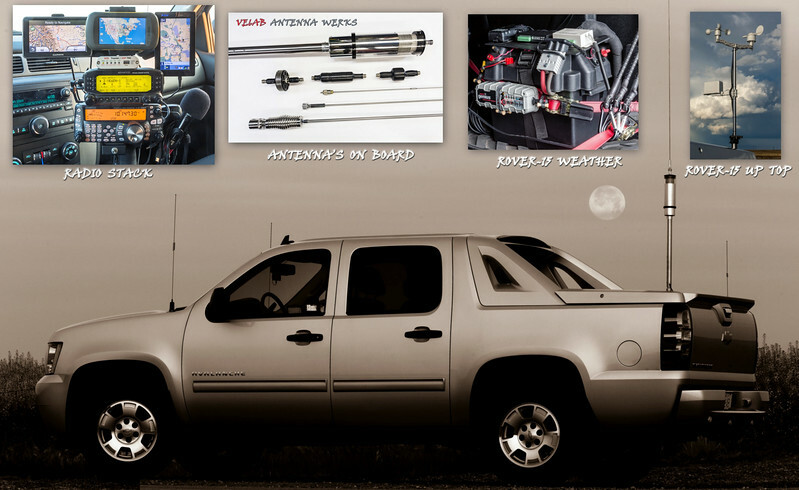 5 - Multiple GPS receivers for APRS mapping operations on both FM and HF transceivers. 7 - A satellite module that clips to the steering wheel, and is used in conjunction with my radio stack when my mobile is stationary for working Low-Earth-Orbit satellites orbiting the earth. I carry several choices of handheld yagis of my own design and build for this purpose. 8 - My mobile has many more features not listed here as they pertain to the multiple AGM batteries, the charging system, remote battery meters, 110 volt inverters, powerpole blocks, etc. that may be read about throughout this gallery. UPDATE.... Over the past couple of years I have added more capability to my mobile in the form of a composite push-up mast from Max Gains Systems that mounts in the hitch receiver. To make this happen I built a 12 volt mast rotator with wireless keyfob operation.